It would seem, on the face of it, to be another one of those cardinal sign posts of adulthood: cleaning up after your dog. After all, it’s the very first thing we teach our kids when we give them a pet, isn’t it? “Now, honey. If you want to have a pet, you need to learn to be responsible for it. You need to walk it. You need to feed it. You need to clean up after it.” Right? So why is that basic lesson seemingly lost on so many adults? Or maybe it’s just here in London where I live. As I ranted a few weeks back upon returning from the pristine, dog-poop free streets of Berlin, many Brits just don’t seem to get the whole dog mess thing. A few statistics to back that claim up. According to Keep Britain Tidy, in 2008 the UK dog population was estimated to be 7.3 million, with dogs producing approximately 1,000 tonnes of excrement each day. In a recent survey of over 19,000 sites, dog fouling was present in over 8% of these sites. The highest level of dog fouling can be found in areas where people actually live. It’s not because there aren’t plenty of signs around telling you to clean up after your dog. There’s even a 50 pound ($75) fine for not doing so, which can go as high as 1000 pounds ($1500) if you need to go to court. But unfortunately, it does rely on establishing a set of norms around this practice, and I’m just not sure how one goes about inculcating a culture of cleaning up dog mess. In my old house, I lived in what’s known as a Mews, which is somewhat akin to a courtyard. Every day for a two month period, some person (not one of us) was apparently getting up really early in the morning, taking their dog for a walk, letting it poo right in front of our Mews and then leaving it there. The amazing thing about this little period in our lives was that the dog did his business in *the very same spot* – literally – every day. For two months. It was absolutely outrageous. It really bothered all of the residents of the Mews and we talked about setting up a patrol to bust this person in the act, even if that required creating shifts to man the watch tower at all hours of the day. But we never got that far. And just like that, it stopped. But I’ve got another idea. You know that whole Great Society thing that David Cameron and Co. are actively pushing as the signature initiative of their new administration? It’s all about volunteerism and civic virtue and getting citizens taking over some of the things that local government previously did for them. To which I say, Hooray, Boys. And here’s your first charge: let’s develop a citizen’s brigade to go out and clean up our streets and free them of dog feces. It ain’t pretty, but somebody’s got to do it. I know I’ll raise my hand. 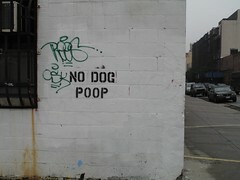 Image: no dog poop by monicamuller via Flickr under a Creative Commons license. This week’s This American Life podcast (http://www.thisamericanlife.org/radio-archives/episode/420/neighborhood-watch) has a segment about just this problem. One solution was to do DNA testing of poo samples and compare them to the local dogs! Thank you for your Politics Daily columns. I’m not too clued up on international politics, and your columns are always interesting and educational. I did just such a rant about dog poo 2 years ago, as our lovely 5 mile walk around the downtown lake was just disgustingly overrun, especially after Sunday when the crew was not on duty. There are boxes and bags provided on nearly every lamp post. The worst was the dog that went in front of our mailbox daily or twice daily and I had to clean it in a hurry or the carrier would not leave our mail. I have just been overwhelmed by the folks not cleaning their leaves out of the storm drains. This has left my sump pumps running nearly full time for 2 days, so before this ice storm, I got our my rake and big compost bags and cleaned out 19 sewer grates. My mum at 94 was extremely concerned about civic duty and the lack of responsibility shown in her world – I think it has gotten worse in the last 3 years. I am holding the bullies in politics responsible – I think is is part of the “I don’t care” attitude these days. Hi Delia .. I absolutely agree – we all have a little time to help our community and do something – get out of our comfort zones .. especially now winter is coming & Christmas – there will be many who are really struggling. I completely agree – help ourselves. Excellent to volunteer .. In North Tyneside there is a council job that is supposed to catch this happening – he walks around with a video. Not sure how effective the role is, but we don’t have a major problem with poo in this area. I think the chalk message is brilliant, not Draconian at all. I’d love it if people kept their cats from chewing the flowers in my garden, making deposits, scratching the soil everywhere. Not v. likely, though, is it? The dog-mess used to be quite prevalent here, especially in Manhattan, but the “clean-up” message was successfully implemented. Where I live now, altho’ most residents have dogs, often 2 or 3, I have yet to see any unwelcome traces & even in NYC, the streets are much cleaner. This did not happen over-night, but it did happen & can be done. they flex, the civilized world sees them as barbarians — a label this very proud land will not like. I blog from Haiti now, but over a year ago I had a crazy cross-cultural-canine-pooping-encounter while taking my Maltese Lucy for a walk in Saigon. Take a look at my post called “‘Not dog on grass'” http://reinventingtheeventhorizon.wordpress.com/2009/07/10/not-dog-on-grass/ for a sense of how this can play out in Vietnam. Thanks for this un-fun with feces post! this is pricelss, kathryn. love it! thx so much for stopping by!